In time, the St. Enda’s history books will record many famous names who have helped to shape our club over the years, but few will be as renowned as the Turbetts and McMahons. On the eve of our big Ulster championship showdown with Slaughtneil, it was fitting that these two famous Clans were united in glory when senior captain Joe McMahon and his brother Eamon delivered the O’Neill Cup and Reserve Championship Cup to the club’s most successful ever player, Thady Turbett and his brother Leo. With their 1948 senior championship medals still firmly grasped in their hands, Leo and Thady relished seeing the O’Neill Cup back in Omagh and wished the boys of 2017 the best of luck for their game with Slaughtneil. As a fresh faced 18 year old, Thady lined out in goals for St. Enda’s in the 1948 decider against Clogher with his older brother Paddy at corner back and Leo on the subs. But that was only the beginning of an illustrious career for Thady who went on to become Omagh, Tyrone’s and Ulster’s most famous goalkeeper, eventually pocketing six Tyrone senior championship titles (including the first ever three-in-a-row), two Tyrone minor championship titles, two Ulster Senior championship titles with Tyrone, three Railway Cups, one McKenna Cup, one Gael Linn Cup and two Lagan Cups. He also represented Ireland in 1954 and 1958. 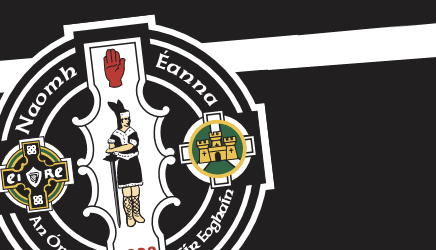 Thady’s Tyrone championship titles were won in 1948, 1952, 1953, 1954, 1957 and 1963. St. Enda’s Famous Five. Joe and Eamon McMahon present the Senior and Reserve Championship trophies to the legendary Leo and Thady Turbett and their nephew Shay, a minor championship winner from 1965. Also flying the flag for St. Enda’s is Thady’s grandson Tadhg. Medals galore….Eamon and Joe McMahon admire the array of medals earned by the legendary Thady Turbett and his brother Leo when they brought the 2017 Senior and Reserve championship cups to the Turbett household on Friday evening.